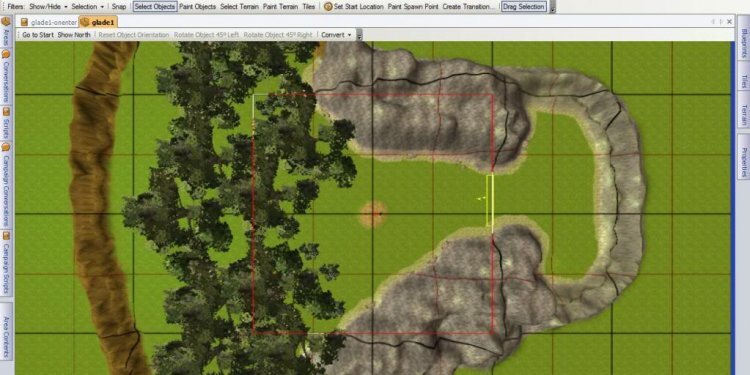 The Aurora Toolset is a powerful and simple-to-use tool that allows players to change many aspects of Neverwinter Nights, create new modules using themed tilesets and turn many ideas into in-game reality. It does not, however, support plug-ins or other third-party extensions. This is the same tool used internally by BioWare to create the official campaigns (and the modules comprising those campaigns can be viewed in the Toolset, once they are played through or otherwise unlocked). The Toolset was intended to be as intuitive and easy to use as possible. All buildings, terrain, and dungeon spaces, for instance, can be painted down using intuitive and context-sensitive tile paintbrushes. At the same time, NWScript allows a builder to weave stories and create characters that behave in an intelligent fashion. There are extensive libraries of pre-existing content that can be drawn from, but these are aids, not limitations. Players can write their own dialog chains, create new creatures and items, and design entire worlds. These creations (in addition to being part of the builder's module) can then be shared with others via the Toolset's ability to export and import resources using .erf files. The Toolset is also intended to be powerful enough to translate most pencil-and-paper modules and homemade campaigns into Neverwinter Nights modules. While not every detail will translate well into (nor to a computer-based game in general), easily recognizable facsimiles should be possible. Also, some monster or terrain models might not be available by default, but it is possible to add new models through the use of hak paks. While the game is available on more platforms, the Toolset is only available for Windows. BioWare's initial goal was to create a cross-platform toolset for the gaming community. However, they were unable to obtain a viable cross-platform solution to assist in porting the Aurora Toolset, so no Mac or Linux versions of the Aurora Toolset were created. Some people have been able to get the Toolset to work on Linux using Wine, though. The Aurora Engine is an evolution of the Infinity Engine, which was used for the Baldur's Gate series of games. While the Aurora Engine is a huge advancement, its roots still stem from the Infinity Engine — all files types, methods of data storage, etc. are the same. Surprisingly, Baldur's Gate II had a wonderful modding community. They even went so far as to create their own toolset for editing the game. So, when Neverwinter Nights was released, it was a great gift to the Baldur's Gate II modding community, and from that, Neverwinter Nights has flourished into what it is today.